Check out SM Cinema's Snack Time Eat-All-You-Can Promo! 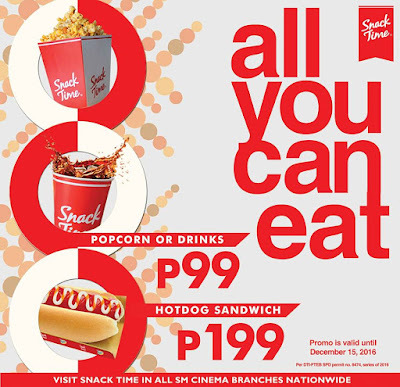 Enjoy ALL YOU CAN EAT popcorn or soda for only P99 or hotdogs at P199 with your purchase of SM Cinema tickets (except for Director’s Club Cinema). Promo runs until December 15, 2015 in all SM Cinema, IMAX & Walter Mart Cinema nationwide.